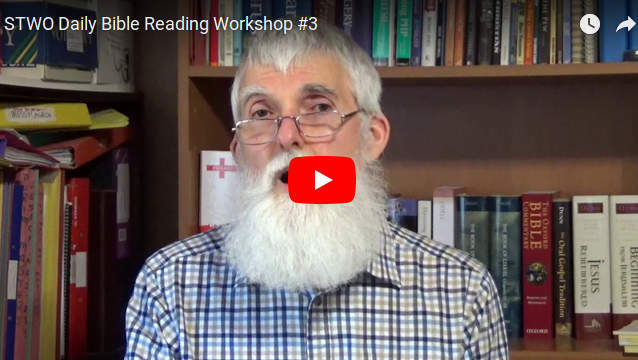 We've just released the third part of Spreading The Word - Online's Daily Bible Reading Worshop today. This is the third of four short video sessions in over a ten day period, with plenty of opportunity to comment and engage here and on social media. Do join us by watching the third video (click the image above) and then leave some comments below to let us know what you think. The fourth session will be released early week. If you missed the first or second parts, just click on the Workshop Started" or "Workshop Session 2 Released" article in the left-hand column and then come back for this one. Although aware of terms like parallelism and repetition today was a step further as you pulled the words apart and dug deeper. Really exciting as it brings the Word out into a new dimension. Have just been in the garden. It's like the end of the winter when the soil is flat and weeds take over - then you turn the soil over revealing the lovely rich dark soil beneath. Can't wait to see the daily studies. Will there be extensions to point those of us who are now blessed with time to go further and deeper. Thank you so much. Toda raba for sharing insight into our Holy Scriptures. The Hebraic context is such a beautiful invitation into learning and understanding how our Almighty G-d desires us to live and to bring Him Glory, what an incredible privilege. VERY EXCITED! I have prayed for such a study as you describe. Sometimes I have thought that wouldn't it be wonderful if I could click on a word as I am reading the Bible that would show me a map, or a picture, or definition. Thank you! ... and will there be music? This approach to deeper connection with the Word is so pleasantly challenging. I am already familiar with some of the phrases and am deeply interested in exploring Scripture with these extensive and exciting new tools. I am really looking forward to the studies.